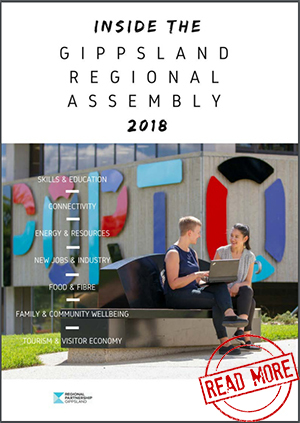 On behalf of the Gippsland Regional Partnership, I am pleased to share with you the findings of the recent Gippsland Regional Assembly. The Assembly took place in Wonthaggi on 28 June 2018, with a satellite session held concurrently at Lakes Entrance. We had almost 250 guests attend across both sites, with Premier Daniel Andrews encouraging the audience to have its say about Gippsland's future. The conversations held at the Assembly have been documented and are summarised, along with the next steps, in this booklet. As a Partnership, our role is now to take the key messages from the Assembly, and our wider consultations, to Government. One of the ways we'll be doing this is to report the ideas and themes heard at the Assembly to the Victorian Government's Rural and Regional Ministerial Committee. Though our 2018 Assembly is now behind us, the Partnership is very keen to continue the ongoing engagement with the community. We will of course keep you abreast of announcements relevant to our region, via our website, email and on our Partnership Facebook page. As Chair of the Gippsland Regional Partnership, it is a privilege to work with the people of Gippsland to understand their hopes and aspirations for our bright future. This email was distributed by the Regional Development Victoria on behalf of the Gippsland Regional Partnership.